The restored front of the Century Building on First Avenue on a sunny day last week. Whoever built it in 1905 called it the Century Building, maybe hoping the 20th would be a great one. 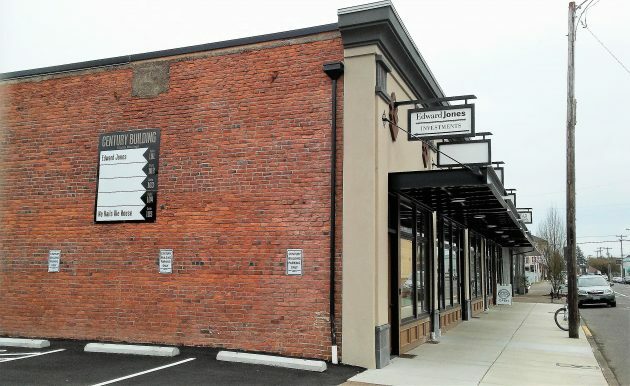 Now the building on Albany’s First Avenue has been given a new look that manages to restore the simple elegance it may once have had. It was in June 2014 that Rick Mikesell, the owner, went to the Central Albany Revitalization Area board with a proposal to renovate the building at 117-123 First Avenue N.E. The downtown urban renewal district eventually approved a $500,000 loan toward the project, to be repaid over 20 years at $25,000 annually, starting when the work was done. Mikesell told me via email that to this point he had spent around $1.2 million, with the interior build-out on three suites yet to go. Nathan Reid, urban renewal officer at City Hall, told me the owner had applied for the final $50,000 of the loan amount, and the city was waiting to make the payment until it issues a certificate of occupancy for the remaining units. The original drawing showed six office suites or storefronts, and now there are five. “We combined two for the No Rails Ale House,” Mikesell explained. 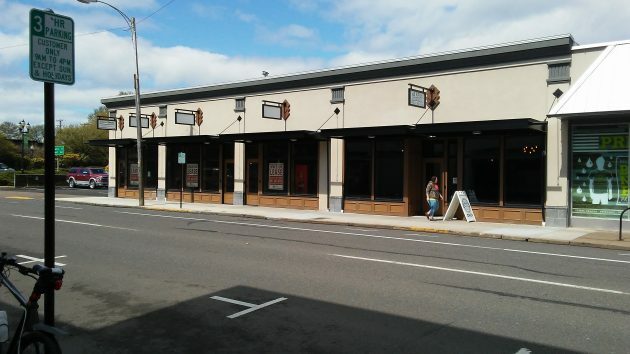 The ale house is one of two businesses already open. The other is an Edward Jones brokerage. Mikesell previously restored the former J.C. Penney Building several blocks to the west. I asked him if he had other projects in mind. “Will fill the one vacancy in the J.C. Building and the three in this one before looking at additional projects in Albany,” he told me. 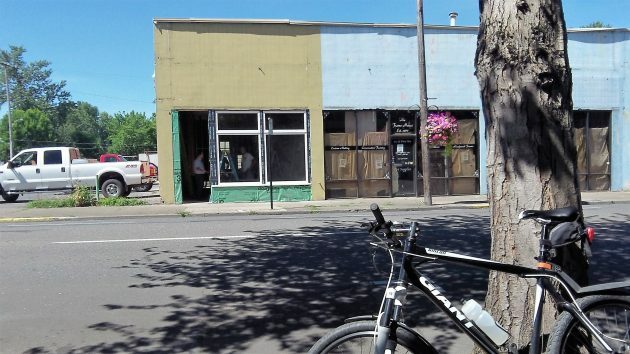 In the meantime, he’s working on an old furniture store in Eugene that he bought in December. The Century Building has a colorful history. It started as a two-story affair, with stores below and hotel rooms above. Fire destroyed the second floor in about 1940, and it’s been one story since. The before view: The reconstruction was under way in July 2016. A canopy runs the length of the building, not a bad idea for rainy days. Not a fan of the steel awnings. The rest looks much better, and a good restoration. Kind of a pity that they did not restore the second floor back to its original appearance. That is easy to say when it is someone else’s money. This undated photo would appear to be taken during the Vanport flood (May 1948). So the second story was there during the period of significance. That is more likely the 1964 flood. Ean, I stand by my 1948 date. The First Christian Church on the NW corner of 4th and Broadalbin is still standing in the photo. This church was destroyed by fire in 1960. Oh, looking into the historical data you may be right. I didn’t think the 48 flood rivaled the 64 flood but according to records it was pretty close. Cheers! Thanks to “The Goth” for the pictures – took a second to get oriented. Kudos to Mr. Mikesell. It takes guts to take out a half million dollar loan and ultimately spend 1.,2 M (how can it cost that much???!!!!) on speculation. These are the type of people that advance commerce, the community and our local society. Godspeed. According to the city attorney, CARA is “a lender of last resort.” This means CARA offers loans to businesses and/or individuals that are experiencing financial difficulty or are considered by the private banks as highly risky or near collapse. Did CARA perform due diligence on Mr. Mikesell to determine why no private bank would lend him money? Did CARA assess the risk of this loan? So the question becomes – why does CARA give substantial loans and grants to rich people? This isn’t a criticism of Mr. Mikesell or his family. This is a criticism of CARA and the fraud they perpetrate on Albany property taxpayers. City government shouldn’t be in the loan business. Thanks for the “history” Gothic! This is a classic example of exactly why CARA-ARA is another :proof positive” and a very good thing to have happen & evolve for the betterment of our community. My quick internet digging give a date of November 1953 for the Morris Hotel fire. What a beautiful renovation … thank you Bill Ryals for the stellar design work and Mr. Mikesell for the vision!